The Pink Ladies enjoy round-the-clock cocktails en route to a Grease-themed dance session. An award-winning restaurant is shaking up its festive offer with round-the-clock cocktails in response to customer demand. 1884 Wine & Tapas Bar hit upon the idea of welcoming guests outside normal restaurant hours by appointment for special celebrations, or just as a haven from festive season frustrations. The restaurant, at the corner of Hull Marina in Wellington Street West, closes between 3pm and 6pm most days to give the chefs a break and allow them time to prepare for the busy evening service. But Deborah Spicer, Director of 1884 Wine & Tapas Bar, said it became clear the demand was there for special drinks parties after she received a phone call from the Pink Ladies! 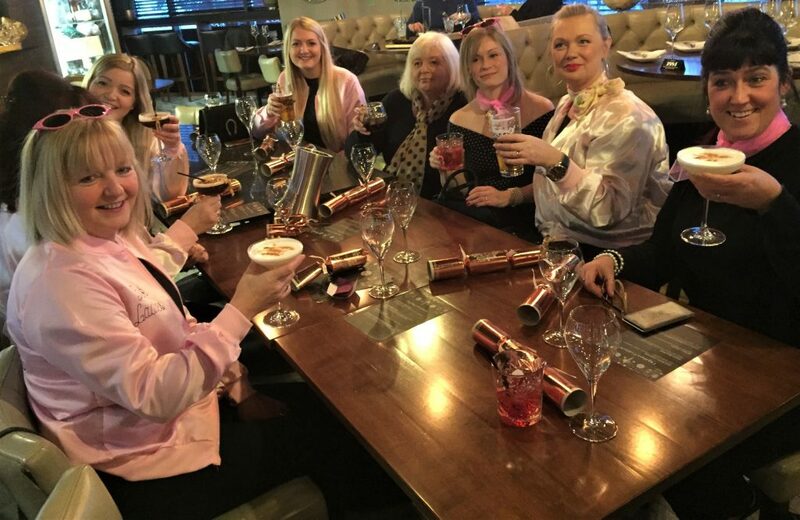 The group rang the restaurant and explained they were planning a hen party treat of Grease-themed dance lessons at the nearby gym at Kingston Park. They didn’t fancy throwing their moves on a full stomach, but they rather liked the idea of donning their Pink Ladies jackets and loosening up with a cocktail or two. Deborah said: “Our cocktail crew looked after the Pink Ladies, serving up some special mixtures from our regular cocktail list and our new Christmas selection and meanwhile the chefs continued their preparations for the busy evening service. “The ladies all had a great time and certainly had more of a spring in their step when they left! We’re now promoting round-the-clock cocktails by appointment through our website and social media. The Christmas cocktail creations are part of a festive package which is already proving popular. In common with most restaurants 1884 Wine & Tapas Bar will be closed on Christmas Day and New Year’s Day but lunch and dinner service promises to be buzzing during the coming weeks, and demand is high for places for the two big nights. On Christmas Eve the restaurant will serve the December menu which it launched recently and which features such delights as venison, pigeon and sea bass. For New Year’s Eve the chefs will present an array of dishes including lobster, halibut, salmon, duck and sirloin, with a glass of Taittinger on arrival. Be the first to comment on "Restaurant is counting down to Christmas with round-the-clock cocktails"